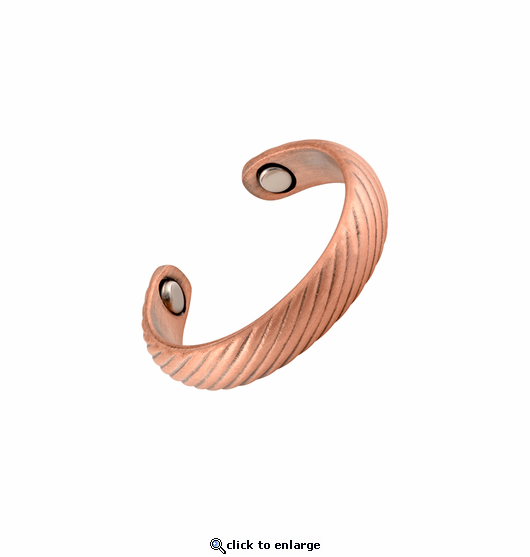 This is a nickel free copper magnetic adjustable ring. It has a 1500 gauss neodymium rare earth bio north facing magnet on each end. It will fit small to medium finger ring sizes about 6 - 9. My concerns were addressed immediately and when I received the product - 2 therapy rings - they were much more substantial than I expected. I love wearing them! Perfect. I like so much. This has been a relief for an arthritic finger joint. I wear it day and night. I switch fingers if I sense another joint that will likely flare I can do my crafts in greater comfort. Love my rings. Bought 2 of them and I know they work for me. No more stiffness in my finger and wrists. Would definitely buy again. I bought both this and the heart ring. This one is a little thicker than the heart ring-more rounded- and it doesn't adjust as easily because of it. It pinches my finger occasionally, the heart ring does not. It is more delicate looking than the heart ring, but it is NOT more delicate, I'm pretty sure it even weighs more. It seems to work just as well, of course, just doesn't wear as well for me. Stop the pain in my thumb. My girls and I love this ring.. I am love this product and service,thank you! I liked the idea of a free sizing ring. And while I don't have any real pain in my fingers, or hand; I am often on the computer typing, so thought a little measure of magnetic would be good here. I love it, I never take it off.